Written by a leader for leaders, The Millennial Whisperer shares proven, profit-driven strategies for leading millennials in the workforce. The Millennial generation is the largest, most diverse generation in the history of the United States. They will make up 75 percent of the workforce by 2030. Unfortunately, Millennials made a poor first impression in the business world, developing the reputation of being lazy, entitled, selfish, and disloyal. The truth is, Millennials are no lazier or more entitled, selfish, or disloyal than any previous generation; they just grew up with different experiences than older generations and are motivated by different things. 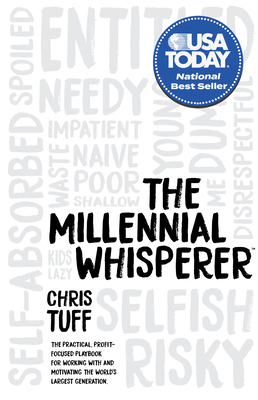 In The Millennial Whisperer, Chris Tuff puts into context the ways Millennials differ from previous generations and shares practical steps companies and leaders can take to immediately boost productivity without building an office full of ping pong tables, beer kegs, and participation trophies. Chris provides practical ways for leaders to build a corporate culture in which Millennials can thrive, establish effective rewards systems at lower cost, address disciplinary methods effectively, and more Get ready to turn your conference room back into a conference room, bring the beer kegs home for your next birthday bash, and put the participation trophies in the trash where they belong.